Pulmonary function tests are breathing tests to find out how well you move air in and out of your lungs (spirometry), the size of your lungs (body plethysmography), and how well oxygen enters your body (diffusion capacity). 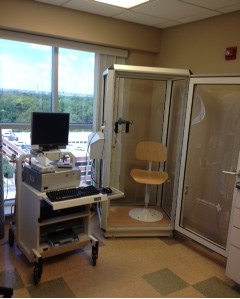 The spirometry is occasionally performed both before and after receiving an inhaled medication. The purpose of such testing is to determine your responsiveness to medication, which may affect the diagnosis and treatment options.